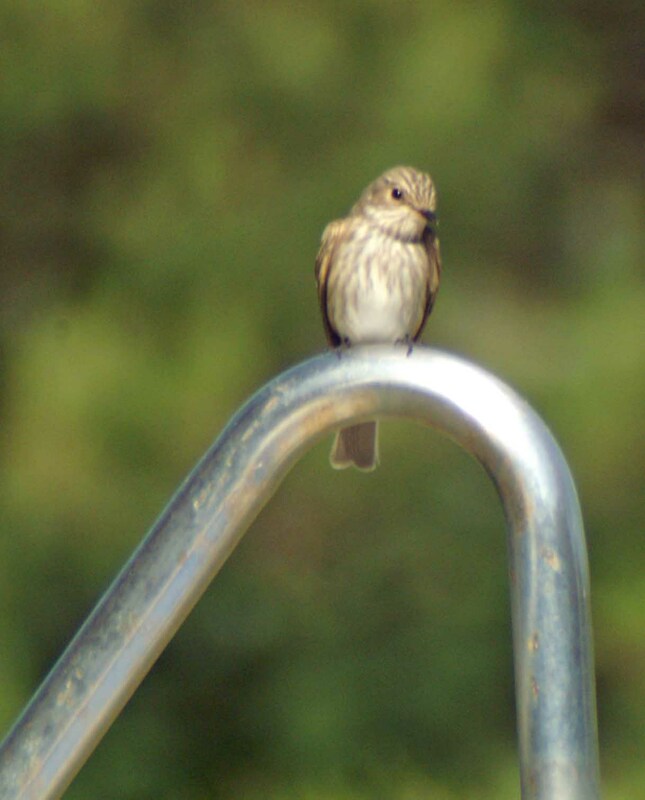 July and August are not the best months to see birds in Southern Spain, but one that can still be seen in a diverse number of locations, fairly frequently and right through to mid-late September is the Spotted Flycatcher. Although not colourful, they are very attractive and characterful and very entertaining to watch as they dart from their perch to chase acrobatically after flying insects. 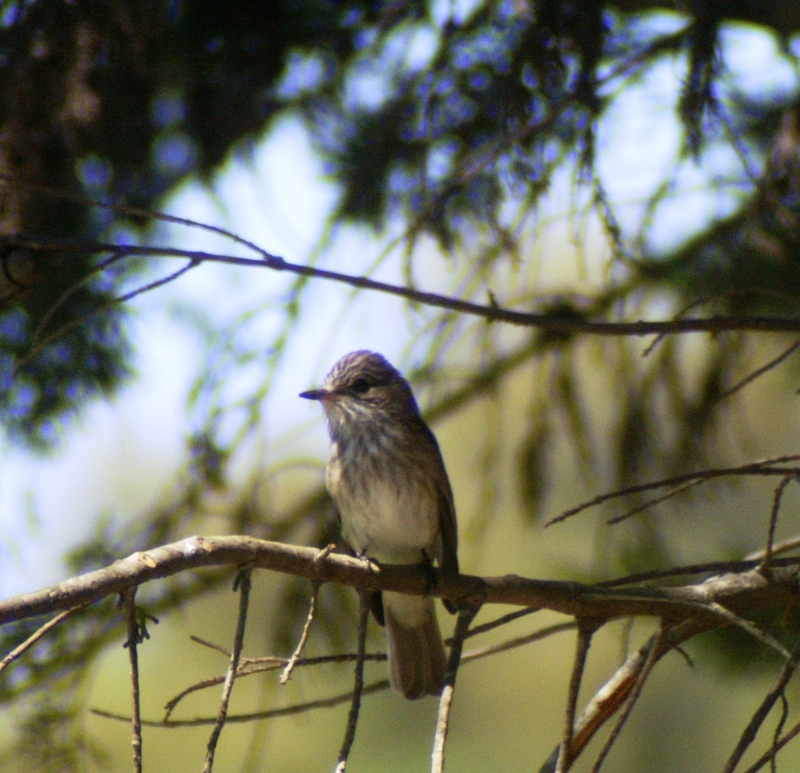 ‘Spotted’ Flycatcher is a bit of a misnomer, as the adult bird’s head and greyish-brown throat and breast is streaked with brown rather than spotted, as suggested by the ‘striata‘ of its scientific name. Having said that, the young birds could be described as spotted, so perhaps that’s where it stems from. 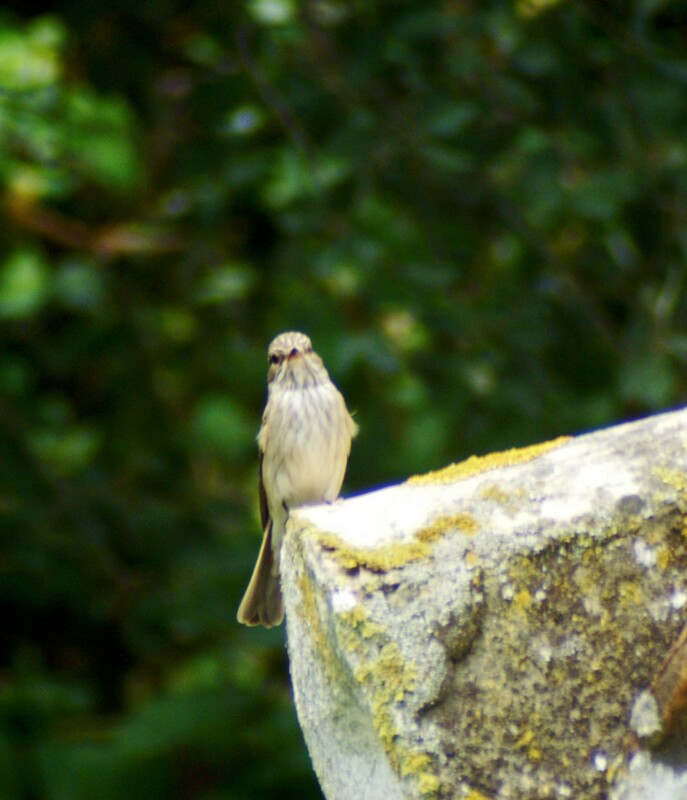 Spotted Flycatchers are summer migrants to Southern Spain, and are then very common throughout the region, often staking a claim to territories that include gardens and other ‘humanised’ areas. They arrive from their wintering grounds in Africa to breed here, sometime around the end of April to the beginning of May, as insect numbers are rising. We were very lucky to have had Spotted Flycatchers return to our garden every year and I used to look forward very much to their arrival and the opportunities to watch them at very close quarters. I have no way of knowing whether any of the returned birds were the same ones that had been to this particular place in previous years; I have been informed by people that are far more knowledgeable than me on the subject that it is not very likely and that this is simply a ‘territory’, open to claim by whichever bird gets there first and can hang onto it. I still like to think that at least for some of the years it may have been perhaps at least one of a pair that had been before, or perhaps one of the young ones that had been raised there. I also discovered from the BTO website that the maximum recorded age for a Spotted Flycatcher is 7 years 10 months 7 days (Recorded in 1963), so surely they don’t go about hunting for a new home every year! Some newly returned birds made more of their arrival than others. On a couple of occasions I have become aware of them as the first thing they did was to take a bath. Others arrived quietly and were just suddenly ‘there’. The occasional one arrived with some drama. 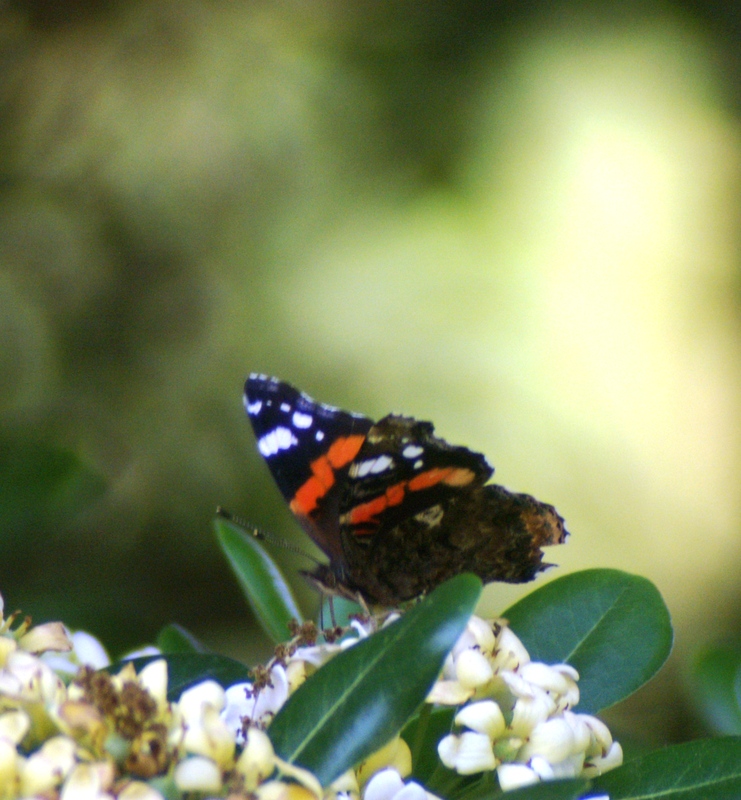 The day the bird in the photograph above arrived back I was out in the garden having just taken some photographs of a lovely Red Admiral butterfly that was posing obligingly on some blossom. I thought I had glimpsed the bird a little earlier on perched in our tall yucca tree, but was taken completely by surprise when it suddenly swooped past me, snatched the butterfly from where it was basking and swooped back to the tree with it. At least I had a photograph of the butterfly to mark its short life. Within our garden there were several favoured perching spots, some of which were in open spots that were clearly visible from the house so I could watch them closely and without disturbing them; one was on the hand rail of the swimming pool, another on the top of the outdoor shower. They definitely show a preference for perches that are not too far above the ground and in other locations I often saw them on boundary fences or on top of posts. While they wait for prey to fly into range, the bird sits upright, head slightly sunk into its shoulders. When it spots potential prey it darts out after it, then depending on the outcome it may loop around to return to the same perch or swoop to another. A range of insects in addition to flies will be pursued as potential food including butterflies, bees, wasps and hoverflies. The birds begin breeding in May, soon after their return. 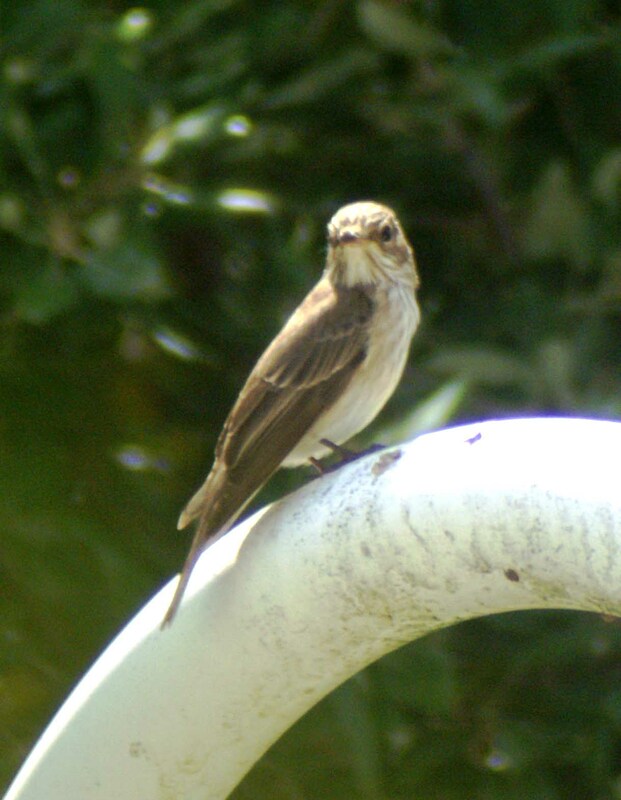 In June 2006, I was thrilled to see ‘our’ pair of flycatchers together with a family of three young ones. They were all gathered on a branch of one of the cork oaks that overlooked the garden at the back of the house and the parents both worked hard at keep their offspring supplied with food. 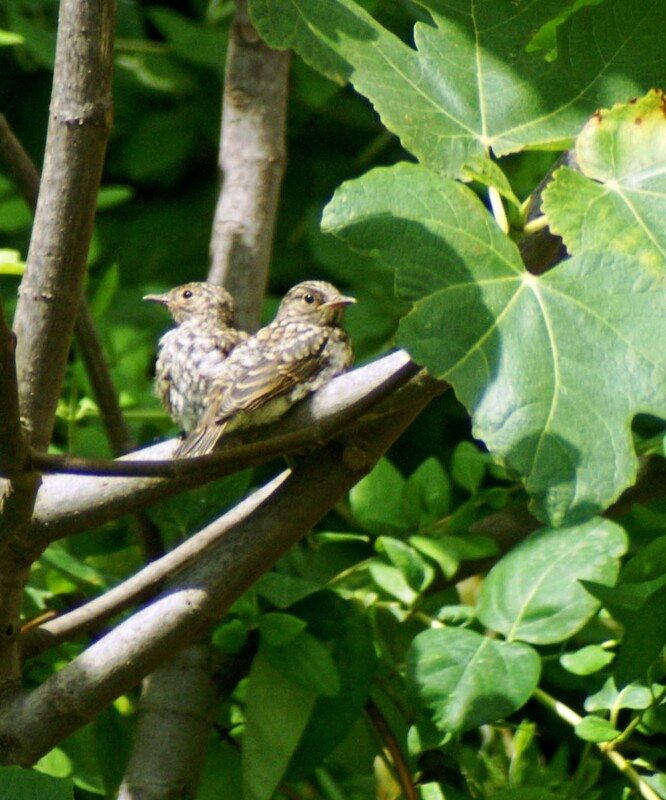 The following day I was even more delighted to see that two of the young birds were perched together in the small fig tree that grew against the wall on the boundary with the Cork Oak plot and no more than a metre from a bedroom window. 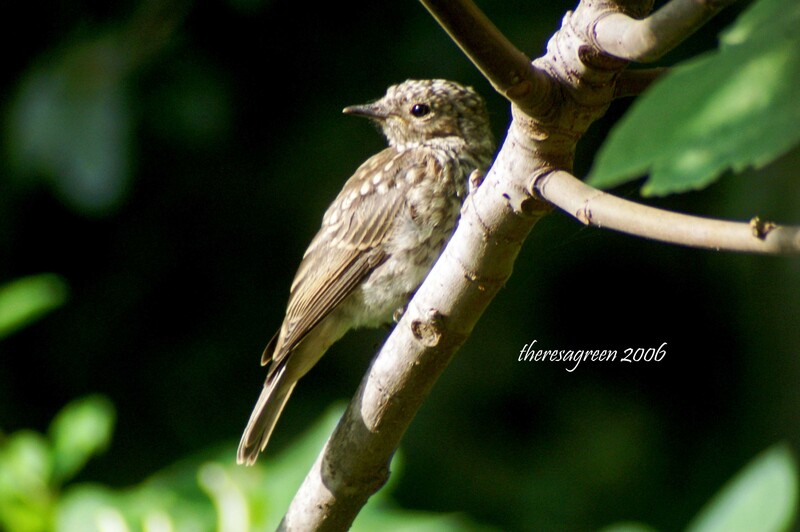 The young or juvenile spotted flycatchers are a more grey-brown than the adults and are prominently speckled; they remain dependent on their parents feeding them for about three weeks after leaving the nest. It must take quite a bit of practice before they become adept at catching their own. The birds will be around until at least September, as long as there is food available, before heading back to their winter feeding grounds. They may well be joined by others on their return migration south from Northern Europe too, that stop to refuel before also heading off. 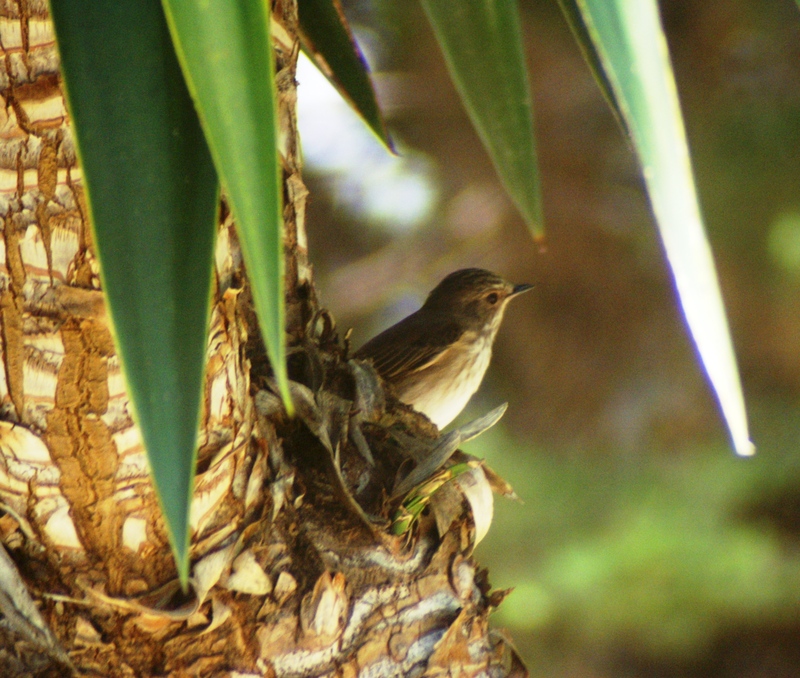 This entry was posted in Birds of Southern Spain, Migrant birds, Nature, Nature Photography, Wildlife of Cadíz and tagged brown bird that chases insects, muscicapa striata, spotted flycatcher, spotted flycatchers. Bookmark the permalink. I’ve been enjoying reading your blog. Next July we will be returning to Alora for our family holiday. 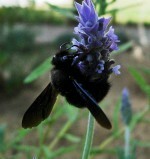 I am hoping to visit the Sierra Nevada to look for butterflies. 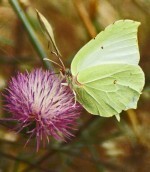 Do you have any tips for good places there to look for butterflies, or possibly anywhere nearer towards Malaga. Thanks for any help. Thank you so much for the information. I really can’t wait to visit the Sierra Nevada. We will be about two and a half hours away, so if I leave early I should be able to get there by about 8.30 or 9 o’clock (I won’t take the kids!!). I’m happy to walk and explore the area. On my previous visits to Spain I have tended to see the same species of butterflies, so it will be fantastic to see some new species! So pretty, it makes me with for spring – birds, bees and butterflies! Me too! One of the attractions of Southern Spain is that it has two spring-like seasons, one that starts around February that lasts till the heat of summer takes over, then another that starts with the ‘autumn’ rains, usually in October.